Brand new sparkling clean 1000 sq ft facility located at a very high traffic (both foot and cars) area in a corner strip mall. The equipment was purchased less than a year ago, and is all heavy duty and has the capacity to handling serious sales volume. 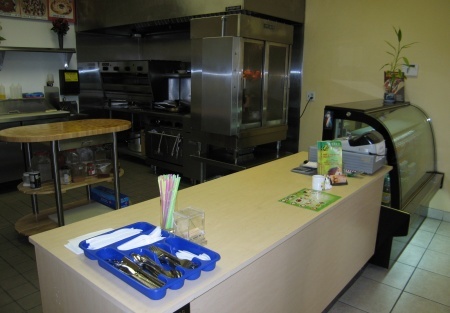 Beverage display case and counter can be moved back to increase dining area. Sales are showing a steady upward trend. Huge potential increase in volume by promoting take-outs and specials. Great facility to convert into your concept! Owner is willing to accept any reasonable offer. This is a a Paramount Restaurant Brokers, Inc. listing.